"In 1950, Brazil hosted the World Cup. In the largest stadium in the world, Maracanã, the Brazilian team went up against Uruguay in the grand final. The country celebrated. In the small town of Bauru, a boy and his father, together with family and friends, anxiously awaited news of the victory they had dreamt of. However, unbelievably, Uruguay scored two goals and won the Cup, dashing Brazilian hopes. At Maracanã, the fans sat immobile, in shock. The streets of Rio de Janeiro were filled with people crying. For the boy, however, all of this would be nothing compared to the image of his father in tears, completely crushed by the Team's defeat. Before going to bed, the boy hugged his father with all his might and made a solemn promise: "I will win the World Cup, dad. I'll bring the title to Brazil and to you". Eight years later, the humble 17-year-old boy from the interior fulfilled his promise, making Brazil the world champion. Thus began the story of Pelé, considered to be the greatest athlete of all time and the most recognised man in the entire world. With a glorious sports career, he scored an impressive 1283 goals in 1375 games as a professional football player and earned titles both on and off the field. 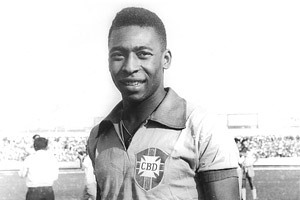 He began his professional career with the Santos Football Club in 1956, at only 16 and, over 21 years, gained 59 titles including two-time champion of the Libertadores da América Cup and the Interclub World Tournament, and three-time World Cup champion, with the Brazilian National Team. He became the greatest idol of the team and the greatest footballer in history, the youngest World Cup champion of all time, at 17, when he was dubbed King for the first time, and the only player to win three world championships with a national team. He ended his professional career in 1977, after playing for 3 years with the New York Cosmos, where he won the American League title and introduced football to the young people of that country. 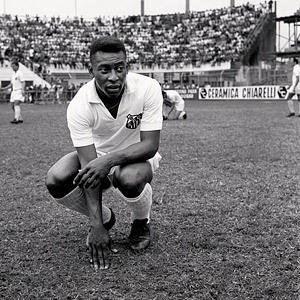 More than an incomparable player, Pelé was an exceptional athlete. He ran 100 metres in 11 seconds, only one second more than the world record, was capable of jumping 1.80 metres high and 6.5 metres in distance. His singular determination, creativity and talent created unprecedented and spectacular plays that forever revolutionised the most popular sport on the planet. 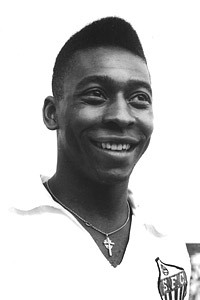 Pelé became legend, revered for his deeds as both an athlete and a man. Among the hundreds of national and international homages, he received the title of Athlete of the Century five times, was chosen as Athlete of the Millennium and inducted in the Hall of Fame, in the USA. He won the "Athlete Who Changed the Game" award and the Oscar for the sport. He was named an Honorary Knight of the British Empire, a Citizen of the World by the UN, Ambassador for Education, Science, Culture and Good Will by UNESCO, Ambassador for Ecology and the Environment by the UN, Minister of Sports by the Brazilian Government and Ambassador for Sports at the 2006 World Economic Forum in Davos."